Four students from Klein High’s Speech and Debate team battled it out with teams from around the globe for five months for a shot at the International Public Policy Forum championship. 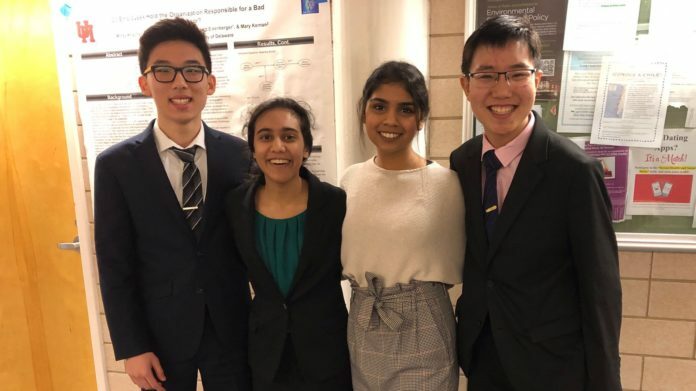 The team consists of Hanaa Irfan, Fatima Raja, Brandon Wu and Andy Zhou, learners with an acute “we not me” attitude who quickly identified each other’s strengths and weaknesses in order to celebrate their diverse skills and collaborate to achieve their shared goal. Every year, the Brewer Foundation and New York University release a debate topic concerning public policy. All public and private high schools in the world are invited to submit a qualifying round essay, affirmative or negative. The competition is narrowed down one round at a time, one rebuttal at a time, one essay at a time. Out of the 200 teams that submitted a qualifying round essay, Klein High made it to the “Sweet 16” teams in the world. Speech and Debate Director Ryan Hennessey believes that this experience empowered the students to enhance their critical thinking and problem-solving skills beyond the classroom. All four students are grateful for the opportunity to develop into interconnected global citizens and are proud to make a name for Klein ISD in the district’s first brush with the competition. “Our guiding documents talk about how we should have access to different pathways in order to find our purpose and although we don’t have an international relations teacher here teaching us global politics, we still have the ability to explore that subject and I think that that’s the point, it’s given us access to our purpose,” Wu said. The team hopes that future generations of Klein ISD debaters will be inspired to follow in their footsteps and embrace this unique challenge!